“Lyrics today aren’t poetry, just bad prose,” rightly says Gulzar. If not for the prose, the latest issue of Outlook (June 26, 2006 Volume XLVI, No. 25) is a must buy for the melody in the ‘free’ Sa Re Ga Ma (previously HMV) CD accompanying the magazine. 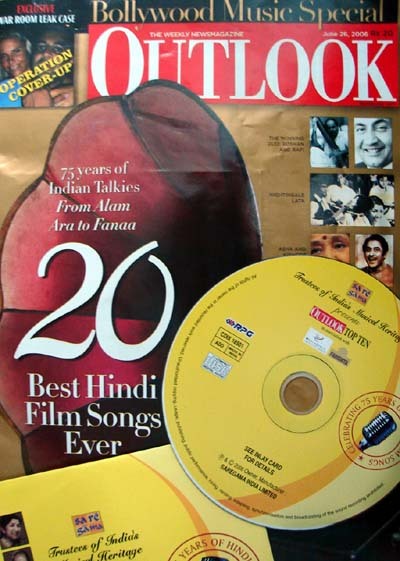 It features 10 select numbers to celebrate the 75 years of Hindi film songs. For Rs 20 it’s more than worth it. My opinions on the observations on the views and observations in this issue of Outlook would find space in a later post.